Hey Guardians! This is the thread detailing the upcoming class changes being posted to Bullroarer for you to play with and comment on. These changes are not final! There will be an upcoming pass based on feedback, balance issues, and bug reports. As Cordovan requested, please keep it civil, and stick mostly to your own thoughts and opinions on the update. It's far easier for us to go through the feedback if it doesn't devolve into people challenging each other's opinions. The prior implementation was very complex and buggy, and proved resistant to debugging. The prior implementation was too server process intensive due to the way bleeds were being handled. The DPS of the red line guardian was far too low to make it particularly functional for soloing or as a team DPS member. The goal of this redesign is to strip out a lot of the underlying complexity of the tree, while retaining its general flavor and giving it a faster, more effective skill rotation. The line is intended to be a functional soloing build for the guardian that will allow them to play through the game at a much more acceptable pace. It is not explicitly intended to be fully competitive as a raid-DPS line, though we'll see where it actually sits in testing. Overall skill damage for the guardian has increased substantially. The blue and yellow lines will see some benefit from this through the base skills, but the red line will see the bulk of this benefit, through their tree specific skills and bleed effects. The tiering bleed concept has been eliminated due to bugs and performance issues. Additionally, we felt it was not a good concept for landscape play, as it took too long to set up Bleed stacks to be worthwhile. The new version has three separate bleeds associated with Sweeping Cuts, Thrust, and Brutal Strike, and the primary skill rotation revolves around keeping these up as efficiently as possible, while weaving in other skills as feasible. There are still some skills that play off of existing bleeds (such as overpower), or cash them out (such as Honorable Combat), but otherwise the bleed structure is much simpler and the interactions are fewer and much more explicit. While the red line bleeds are now stronger, they no longer benefit from the yellow line Radiate talent. Guardian bleeds are no longer applied or renewed by crits. Several talent names were changed to reflect adjustments to their functionality necessitated by the redesign of the bleed skills. Several other skills that had accumulated too many modifiers were streamlined a bit, such as Hammer Down and To the King. Some changes to the way damage is assigned to skills and effects is being made. These changes are largely not visible, as they are low-level changes behind the scenes, but these adjustments will make it easier for us to make changes to the classes in the future, and should make future design updates happen more quickly. Shield Smash and Warchant are no longer tactical skills and draw their damage from the primary weapon. Brutal Charge should now cause the next skill to crit rather than knockdown (note that it can still be b/p/e'd). Warrior's Heart bubble is now based on a % of max vitality. Catch a breath LI bonuses now properly affect the skill. % change is now additive, and has been adjusted to reflect this change. Shield Use is effectively obsolete for the time being (weapon damage applies instead). We're evaluating what to do with it currently as it has never scaled properly with our other systems. Make sure your feedback is focused on the class work seen in the Release Notes and the writing above, or focused on your specific feedback regarding the class in cases when you feel it necessary to discuss things beyond what is in the notes. DO NOT REPLY TO OTHER POSTS IN THIS THREAD TO PROVIDE YOUR OPINION ON THEIR POST. We want to be able to use this thread to foster a productive discussion between you and the development team, and that means we are less interested in your opinion about someone else's opinion. If you are responding to another poster in this thread, it should not be to provide your opinion about their post. If you are providing feedback that is not in-line with another person's post, you can simply provide that information independently. Posts about someone else's feedback that are opinion-based in nature WILL be deleted from this targeted feedback thread. If you must have this discussion, please do so in a new thread on the Bullroarer forums, and not in this thread. Please be civil. Insulting, harassing, abusive, or profanity/filtered profanity-laden posts will be deleted. We welcome critical feedback as it relates specifically to the work being done, but this thread is not the place to provide your opinion on the development team itself, or your view on the historic work that has been done or not done in regard to class balance. In order to get the most use out of this thread, you can expect me to be a bit more heavy-handed on moderation than I typically am. Recognize that this class balance work is not a comprehensive and final adjustment to classes, but is rather the first in a series of changes aimed at improving LOTRO's classes throughout the game. We are happy to read about what further work you would like to see, but want to make sure you understand that this is not the final step in this process. There is some chance that we will not respond immediately to your comments today, as we would like to gather some feedback initially in a relatively "neutral" way prior to providing responses. Thank you for your help in making sure we get this right, both now and in the future, and thank you for the time you spend on Bullroarer in the coming days to try out these changes in-game. [COLOR="#0099ff"]Hey Guardians! This is the thread detailing the upcoming class changes being posted to Bullroarer for you to play with and comment on. How is this class balancing when other classes have two legendary items with main line legacies powered by starlit crystals and now Guards only have one. All the starlits I put on my belt are now useless so its like crippling a class compared to burgs that have DPS on weapon and incoming healing on the tools (for example), we have dps on the weapon and nothing on the belt. You couldn't have at least converted shield use to incoming healing? And changing shield smash and war chant from tactical to damage based on weapon? What weapon is associated with war chant???? Before I could stack tactical mastery to both buff my damage and healing but with no tactical skill affecting my DPS, tactical mastery is pretty much useless. Will have to change essences to physical mastery. I know this without having to do any testing. In fact testing will be difficult since my gear is not designed for the changes. I will need essence reclaimation scrolls and new essences to even see what the new system is really like. This change alone means I need to change most of the essences on my Guard. Horrible changes as its not class balance but total class and build redesign. Last edited by TiberiasKirk; May 09 2018 at 07:40 PM. Extensive testing is on the way. Will provide details here. I'll hold off on commenting on the Red line redesign until I see it in action. This is pretty nice I suppose. Not sure how I feel about this one. Red will never be something you would willingly run in a raid scenario, so this kinda hurts solo survivability. Then again, since the Red line is being redesigned, maybe crits will matter more? Incoming healing would probably be a safe suggestion. Can we get a confirmation if at least something will replace it before going live? Not sure if anyone is aware, but the rune slotted on the belt IA item provides a MASSIVE DPS increase to gaurdian's Shield skills, possibly due to Tactical Damage Rune providing a boost to the shield use rank. A few things I notice. First, Guards have a very impressive-looking legacy that increases the critical damage of bleeds, but it was never useful because we were constantly refreshing bleeds and they can't crit when they refresh. Since we're not going to be able to do that, the bleeds should crit now, and the legacy will pump our numbers up? Okay, but consider that most of our damage in AOE situations was those bleeds bouncing off each other, I'm guessing our single target damage will see a big increase but our AOE damage won't go up that much or it will go down. By the way, why can't Guardians get their bleeds up fast enough for the tiers to be useful? A few years ago a dev borked the class and, among other things, nerfed the trait in yellow line that gives a chance of refreshing bleeds and debuffs (30% to 15%). Never got fixed. Thanks, I guess. And Brutal Charge was already causing the skill to crit, without the knockdown it's basically useless, you can keep those points and spend them somewhere else. I don't really understand why shield use needs to be changed, it makes perfect sense for shield skills and war-chant to be sort of tactical skills because they're threat builders, it's messy but functional (like threat was, and believe me most tanks loved that), but you need to change it, I just really, really hope this doesn't get even messier. But last, and my major concern, is that I see no mention of Prey on the Weak. POTW is, fundamentally, what's allowed me to solo on my Guardian since Helm's Deep. 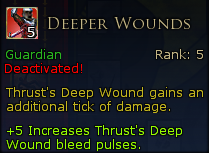 It provides a chance to heal for a percentage of morale when you tier up a bleed. At times, in AOE situations, it can heal for over 20,000 morale on a Sweeping Cut. That was the trade-off with a Champion, you sacrificed damage but gained self-heals. Now I'm imagining Guardians doing more damage, but still significantly less than a Champion, with no source of consistent self-healing and no knockdown (Champions still have multiple stuns they can use). Unless damage is being buffed very close to a Champion's, I don't see how this won't make Guardians unable to solo content like the Northern Mirkwood questlines. Maybe I'm being too pessimistic. What about guardians who bought tactical damage runes to increase their threat generation with shield smash and warchant? Will they be reimbursed? We recognize that this will impact some players' current IA layouts. To manage this, those existing Tactical bonus relics will be removed from your IA items and relic inventories, and be replaced by barter tokens that can be exchanged at a Gorgoroth raid vendor for an equivalent relic (either DPS or HPS), so that you can rebalance your IA build around the new restrictions. 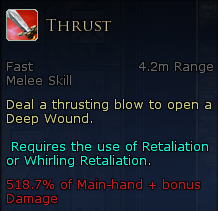 This still won't make Catch a Breath particularly useful as a healing skill at high levels. If I'm reading this right, the actual heal isn't increasing, just the legacy modifier? So it'll still be a +29.4% increase? That's still only an upper limit of around 3682 restored, which is about 2.4-2.8% of the average end game guardian morale pool. Pretty sure catch a breath is % heal now, thats why mention of additive to already existing % on legacy. So it scales same regarding your level. There is no bleed tiering anymore. Red line should see about 2.5-3x stronger st dps. To compensate this: continious god mode survivability is obviously removed. You still have 3-4 extremely potent healing skills (well 5 if someone traits thrill of danger). But all these have substabtial cooldowns so you cant go on eternity. Last edited by siipperi; May 09 2018 at 06:57 PM. Then again, I could be wrong. I'll amend my comment after seeing it on Bullroarer. If you mean the attack skill where your character slowly raises his weapon and hits an enemy down on the head like an old man uses a cane to hit his dumb grandchild, that's Brutal Assault. I don't remember last time I used the skill. Sting + stagger gets off quicker and does more damage. I can't give any authoritative point of view, since I don't have BR installed and reading the patch notes makes me never want to. But it looks like my favorite class has taken a beating yet again. Yeah, single target damage will probably go up. But when 2 of 3 bleed-applying skills are single-target only, and those bleeds can't be copied? Looks like guardian red-line is now a mindless, 3-skill-rotation champion lite. The current system of bleeds has its flaws, yes, but any guard who knew what the heck they were doing could have t5 bleeds in under a second on stuff, and t10 in short order. One of the things I love about the class is that you do better the more mobs you pull ... up to a point. Knowing that point and testing it was half the fun. As far as the war-chant/shield smash no longer doing tactical damage, what will be replacing the now utterly useless +Light Damage LI legacy? Edit: Possible suggestions - if you must do this, make the bleeds dependent on aoe skills. Also - as others have said, what is happening to Prey on the Weak? Last edited by Arathaert; May 09 2018 at 07:23 PM. Guardian has rich rotation and refreshing brutal assault is by far the most important aspect of it, even too much. I would suggest 20% nerf to brutal assault bleed (heamorrhage), 10% nerf to other 2 general bleeds and buff initial skill damage by additional 15%. To make class less reliant on bleeds. I misunderstood the Catch a Breath legacy change, so I'll just say: That's great. I used to rely on CaB a great deal to keep my morale stable, but it's been irrelevant as anything but a power restore and animation interrupt for a long time now. If POTW is gone but CaB is buffed, it adds a more consistent element in maintaining the morale pool. If you could also make War-chant affect its cooldown (the bug has been noted many, many times) that would be amazing. I thought the knockdown was very useful when solo questing on my guardian, I'd knock them down and deal some damage, In my opinion the knockdown is more useful then an extra critical hit. So played around a bit. It looks like the Grand Abyssal Striking runes still show +125 (not sure if this is accurate anymore, since the tactical ones were dropped to +91), but it seems that even with the +125.4 base damage modifier (that is, from +0 to +125.4 on the same weapon), my Shield Smash damage only increase by about 1,000. This seems rather low, but with the overall shift in how the damage runes are working, not sure if its intended? [*]The line is intended to be a functional soloing build for the guardian that will allow them to play through the game at a much more acceptable pace. I'm glad to see this was a consideration. So beings the feedback...trait changes first. Heavy Weapons Training reduced from 10% at max rank to 5%. Damage seems to have nearly doubled. Same case as with Brutal Assault. Protection by the Sword parry responses do no affect Brutal Assaults cooldown refresh when traiting Tireless Blows. To The King damage has gone up by almost 2.5x. Haemorrhage's chance to bleed doubled, no bleed damage increase. Raw Power removed, replaced with Deeper Wounds, increases the number of damaging ticks/duration of Thrusts bleed. 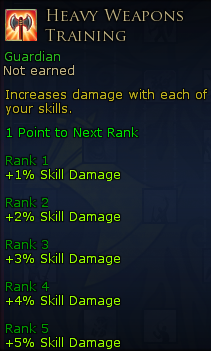 Considering this skill is spammed in the rotation, trait doesn't seem that useful. Warriors Heart when used with Warriors Fortitude from Red Line crashed my game multiple times. ????? Last edited by zipfile; May 09 2018 at 09:20 PM. 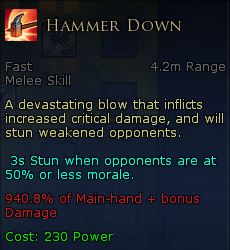 Hammer Down reworked greatly, now stuns enemies under 50% morale for 3 seconds. Damage nearly 3x from live. Overwhelm reworked, now adds a debuff that increases attack duration of enemies if you have the thrust bleed on them. Too weak, not useful. What will happen to bleed removal damage legacy now? 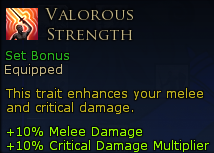 Overpower removed, replaced with a similar talent called Valorous Strenght. By comparison, damage was increased by 5%, removed parry bonuses. So, better DPS, worse solo. Side note: Heavy Blows didn't receive any buffs. Removal of bonus to bleeds from the trait. Reworked Honourable Combat. 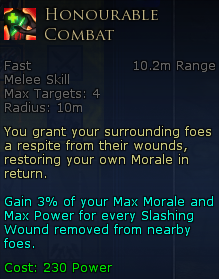 Now grants 3% heal to morale and power for every enemy that's affected by Slashing Wound (this is the new bleed tied to Sweeping Cut). Maximum of 4 targets, so 12% morale and power heal. Now, for the most interesting part. Prey on the Weak. My, oh my...how far have you fallen. No more healing, I welcome that. No more damage, I don't like that. Power restore is....well....why? There are no power issues in the Red line as it is, and furthermore, we already have Invigourating Parry trait. LMAO! Come on, rework this again. It's a joke as a final talent. Last edited by zipfile; May 09 2018 at 08:39 PM. Bleed Them Dry reworked. Now increases the duration of your bleeds, adding 4 seconds to Slashing Bleed (Sweeping Cut) and Deep Wound (Thrust). Last edited by zipfile; May 09 2018 at 09:19 PM. It seems like weapon DPS in general increased, so that's probably why you're seeing a lot of skill hit about 2x as hard. 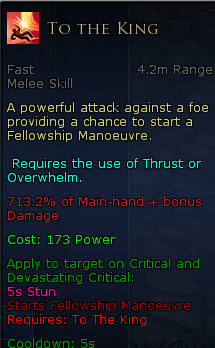 Think my mainhand was something like 880 DPS and my 2h about 1240ish DPS. guardians bleeds are just too strong right now. 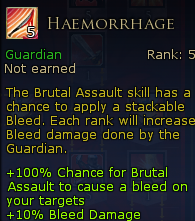 would be better if increased base damage and lowered the bleed damage cause its too high for a tanking class with survivability like guardian. Last edited by Deadly_Myths; May 09 2018 at 11:09 PM.